The best surprises are the ones you never see coming. All Sydney Pearce needs is a change -something to end the stress and chaos of running her grandmother's old restaurant. Maybe then her life will finally start. When she receives a job offer to serve as chef at a castle resort in Scotland, she gets her wish and happily leaves the restaurant to begin a new chapter in her life. However, she quickly discovers that living at Cagair Castle comes with its complications. Not only must she learn to accept the shocking truth of the magic that resides within the castle walls, but she is also faced with mounting feelings for a man born hundreds of years in the past - a man so alluring and kind that, despite her better judgment, she finds herself falling for him more each day. Callum MacChristy doesn't need any distractions. He has enough on his hands with the daily travels back and forth through time and the looming threat of the man who tried to destroy his home. His trips each night are meant to provide him a soft bed and a warm shower while he works and waits for his castle to be restored. Instead, he finds himself spending more and more time with a lass so enchanting his thoughts seem to drift toward her at every spare moment. As their feelings for one another grow, so does an unseen threat that could destroy any chance they have at happiness together. Will the truth be discovered before it's too late, or will an enemy they never expected ruin them all? Love Beyond Belief is about Sydney Pearce and Callum MacChristy's story. Sydney is overworked and need a new change in her life when she can take a moment to relax. When Sydney was notified about a job offer at the Cagair Castle, she jumped at the welcome change in her life. What she wasn't expecting was that magic really truly exist. Callum has suffered an injury after his enemy has set fire to his castle. As he planned to rebuild Cagair Castle, he has never expected to meet the mysteriously woman in his vision in person. When his enemy manipulated the allies and friends against each other, Callum made Sydney promised him to stay in the present so he can protect her from the past except nothing ever goes according to plans. What I love about this book is the second story behind Sydney and Callum's story. Although the main story is entertaining, magical and full of romance as Morna's family gets bigger, no one knows much about Morna except that she is a witch and a matchmaker. The second story is giving the readers/listeners glimpses of Morna's mysteriously past and why she came into our present from her past. I can't wait to discover Morna's story in the next book, hopefully. The narrator Lily Collingwood has a wonderful voice to listen to. I can never get tired of listen to her voice when she goes from the female characters to the male characters. Listeners will enjoy the narrator's tones of all her characters. I was given this audiobook by the author and have decided to volunteer in reviewing this audiobook. I was not compensated or influence in any way of writing this review. What did you love best about Love Beyond Belief? The building romance between Sydney and Callum. The passion Jane had about being a mother. What about Lily Collingwood’s performance did you like? Lily always reads this series very well...never disappoints. When Jane was upset about giving up Baby Nora. Another great book in the series!!! What was one of the most memorable moments of Love Beyond Belief? This is another winning combination of a great story made even better by a great narrator. I have read all of Morna's Legacy books. I truly enjoyed every one of them. It has humor, romance, and my favorite time travel. I have gotten to know the characters so they now feel like family. The books are entertaining but the audio version is outstanding. I feel like I am in the story. I listen to this series while exercising so this keeps me going and motivated to workout everyday. 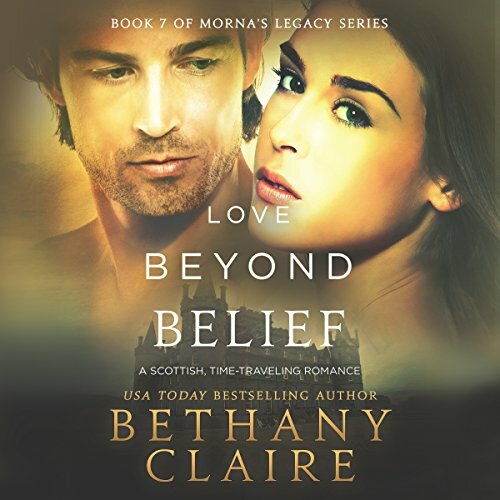 This is a great book; this is the seventh book in the Morna’s Legacy series written by Bethany Claire and narrated by Lily Collingwood. Sydney Pearce needs is a change -something to end the stress and chaos of running her grandmother's old restaurant. Maybe then her life will finally start. When she receives a job offer to serve as chef at a castle resort in Scotland, she gets her wish and happily leaves the restaurant to begin a new chapter in her life. However, she quickly discovers that living at Cagair Castle comes with its complications. Not only must she learn to accept the shocking truth of the magic that resides within the castle walls, but she is also faced with mounting feelings for a man born hundreds of years in the past - a man so alluring and kind that, despite her better judgment, she finds herself falling for him more each day. The narrator Lily Collingwood did a wonderful job with this book. She did a great job with the different voices of each character in this book. It was very easy to listen to and I didn’t want to stop listening until the end. The Morna series has been one of my favorites! This addition is wonderful. Sydney is an interesting character and her attitude is great! She is enchanting and when Callum finally gets his head together, they are magic together. Morna's story hints make it even more interesting. Lily Collingwood did an awesome job as narrator! She has a wonderful voice and her timing and inflection is spot on!! Would you consider the audio edition of Love Beyond Belief to be better than the print version? I like listening and hearing the different voices - it adds to the story. I won't spoil the story but I like the last couple chapters the best. Lily does wonderfully in letting you know who is speaking with her different character voices. Another Awesome book to this brilliant series!!!!! Yes I would definately recommend this book, as I would any in this brilliant series, Lilly does a brilliant job with the voices for the characters, she brings the characters to life. Its hard to pick one thing to like about the story as I've been a fan of this series since the first book and Bethany doesn't disappoint with each new story. I loved the whole of the book and don't have favourite scene as such. Truly enjoyed listening to the book Lilly does an awesome job with the various voices. I enjoy how each of Bethany's books introduce new characters while keeping us in touch with characters from previous book. The way the time travel is handled in the books is a bit different this time but I like it and wonder how the new character will handle their love and the time travel. The author did a wonderful job of developing the characters. I've read it twice and continued to enjoy it again and again.